Second year law student Robert Pecchio’s “Hoops for Honduras” was featured during the Clinton Global Initiative University (CGIU) meeting at the University of Miami in early March. As a featured project, his Commitment to Action received a certificate and was introduced by filmmaker and activist Abigail Disney. A Commitment to Action—the defining feature of CGI—is a plan for addressing a significant global challenge. Commitments can be small or large and financial or nonmonetary in nature. Many commitments are the result of cross-sector partnerships, with CGI members combining efforts to expand their impact. Building on UNICEF-sponsored research indicating that sports participation leads to empowerment of women and girls, decreased instances of youth violence, and reductions in gang membership, Pecchio founded CourtVision International in 2011. This organization creates sports programs in the United States and abroad that use a metacognitive approach to develop youth leaders as peace-builders. "Hoops for Honduras" is a project CourtVision International has initiated in Teguicalpa, Honduras to supplement the work of one such social prevention basketball league there – 3x3 Honduras - led by Director Carmen Cubas. “The idea for this project came from my experiences working in immigration law, specifically with children fleeing Central American communities to the United States due to extreme danger perpetuated by gang violence there,” said Pecchio. "Hoops for Honduras" is Pecchio’s plan to support the youth development league in Honduras, which is working to counter youth violence and empower women and girls through sports participation. Pecchio has spent most of his law school career focused on immigration law, both in advocating for immigrants in deportation proceedings as part of the Immigration Clinic, as well as in seeking benefits for employment/business purposes. He spent his 1L summer as a Summer Public Interest Fellow working at the U.S. Department of Homeland Security. He has also spent time assisting and working with professional and amateur athletes competing internationally. 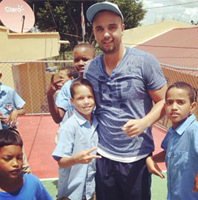 As a youth, Pecchio competed internationally in 3x3 basketball tournaments. The CGI U event brought together more than 1,000 innovative student leaders to make Commitments to Action in CGI U’s five focus areas: Education, Environment and Climate change, Peace and Human Rights, Poverty Alleviation, and Public Health.